Maddie Lipp readies to hit the ball. The senior helped Northwestern earn a 6-1 Senior Day win over Minnesota on Sunday. 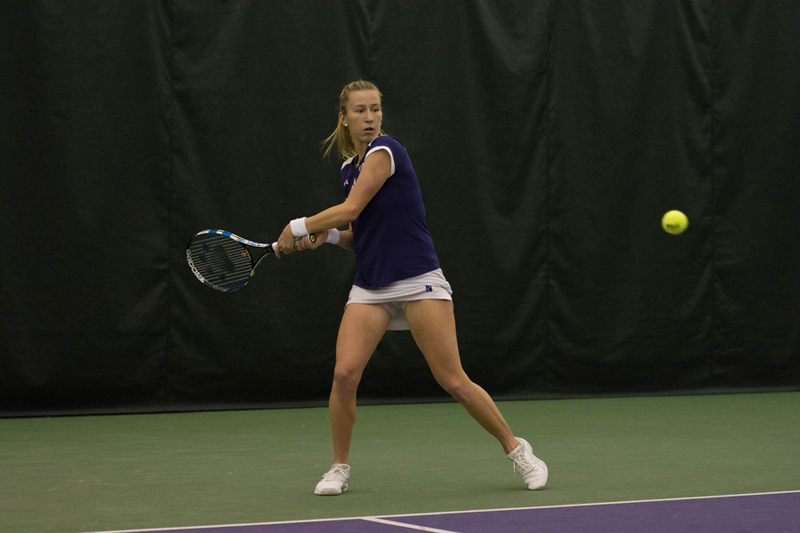 Northwestern cruised to easy match wins against Wisconsin and Minnesota to stay undefeated in conference play this weekend. The No. 12 Wildcats (17-4, 10-0 Big Ten) were nearly perfect against the Badgers (8-13, 2-7) on Saturday, dropping just one total set in a 7-0 victory. NU stayed in form a day later, defeating the Gophers (13-10, 5-3) 6-1 on Sunday’s Senior Day. The first matchup of the weekend was a battle between the class of the Big Ten and one of the conference’s bottom-feeders. The Cats dominated a Wisconsin team that had won just two Big Ten matches all year, winning every match but the No. 6 singles spot in straight sets. Sunday’s contest featured more of the same, with the senior doubles pair of Erin Larner and Maddie Lipp — who entered the weekend ranked No. 4 in the country — starting off the action by dismantling Minnesota’s top doubles pair 6-0. After securing the doubles point with a win from the pair of sophomore Julie Byrne and junior Rheeya Doshi, Larner came up with another convincing Senior Day win at No. 1 singles. Wins from Byrne and junior Lee Or closed out the match for NU, giving the team its 14th win in its last 15 matches. The only loss of the day for the Cats came at court No. 6, where senior Alex Chatt dropped a close one, 6-4, 6-4. The match concluded with Lipp closing out a third set superbreaker win: 6-1, 5-7, 1-0 (8). NU sits at the top of the Big Ten standings and is a game up on second-place Michigan. With just two matches remaining, the Cats are in control of their own destiny and can clinch a share of the conference title with a win next weekend. Should NU sweep next weekend’s slate of matches, it would claim its first Big Ten Conference championship since 2012.